I have some exciting news for you!! 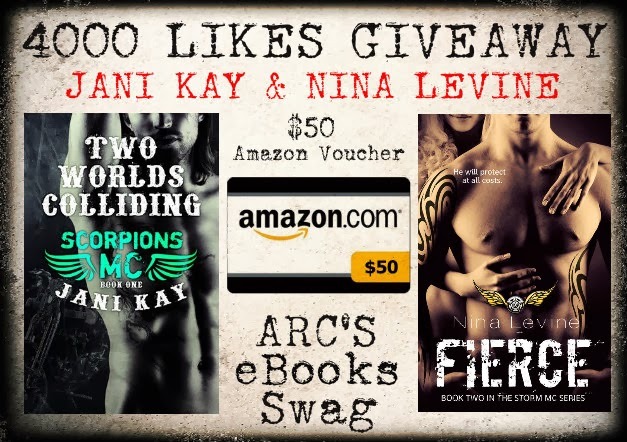 Jani Kay and I have joined forces to bring you our 4000 Likes Giveaway! We have both recently reached 4000 Likes on Facebook so thought it was a fabulous time to run a giveaway. woohoo, thanks for the chance. Congrats on reaching 4000!! Thank you both for the giveaway! Love both your books and I am excited for more! Congratulations!!!! Happy Valentine's Day!!!! Thanks for the giveaway! Congrats on reaching 4000 !!! Thanks for awesome giveaway! !